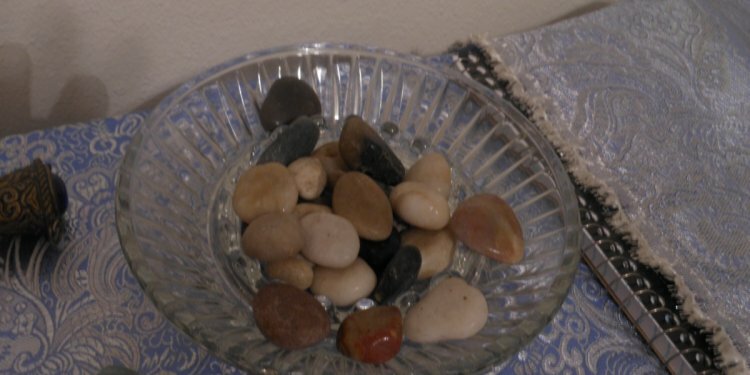 Get some tumbled stones from a river or at the craft store. Use real rock not glass. (The ones in the photo are from my altar.) If you feel sick, either from physical or emotional ailment, take a stone and hold it close to your heart. Imagine the ailment going from yourself into the stone. You can also lay on your back and place the stone on your breastbone, directly on the skin. Once the stone is warm and you feel the energy move to it, place the stone in a sealed container with salt in it. Gently swirl the container in a counter-clockwise direction. This neutralizes the negative energy. Once all the stones have been used (over the course of days or weeks), pour all the contents outside on the ground under the sun or moon to fully cleanse them, then retrieve the rocks and you can begin again. Optionally, you can say a healing spell or chant during the energy moving process. Make the ritual as simple or as complex as you like. Visualizing the energy moving from you to the stone is quite helpful.